Two days ago, we hosted an open house. We thought it would be fun to have our friends in the industry drop by, check out our space, and have some good eats. It was great to share some food and beers with old and new friends alike, and we look forward to doing it again in the future. Thank you again to everyone who came. We continue to be amazed by the great people we have met and the sense of community that we have found. One of the fun things for us when we host events like these is the excuse it gives us to play around in the kitchen. We decided to make some quick refrigerator pickles with Eddy as a base, and a freshly ground spicy mustard with Blaze. Several people asked us about the pickles and the mustard, so we decided to share the recipes. Wash the cucumbers, cut off the ends, and either slice into spears or discs. The ends of cucumbers contain an enzyme that will make the pickles mushy, so you always want to cut those off. In a large pot (preferably with a pouring spout), combine the vinegar, beer, salt and malt extract/sugar. Bring to a simmer. Wash your canning jars and lids, arrange jars on the counter and put garlic and spices in each jar. Arrange pickles in the jars, packed firmly. It’s best to start by placing spears straight up along the outer edge of the jar and then packing the middle to get the most cukes in there without wasting space. Definitely use wide-mouthed jars as it’s difficult to get pickle spears in regular mouth jars. Pour the brine into each jar, leaving ½ inch of headspace. Tap gently on the counter to release any trapped air bubbles. Put on the lids and allow to cool on the counter. Then place in the refrigerator. Let sit for a day or two in the refrigerator before eating, and then it’s best to eat them within a week or two. 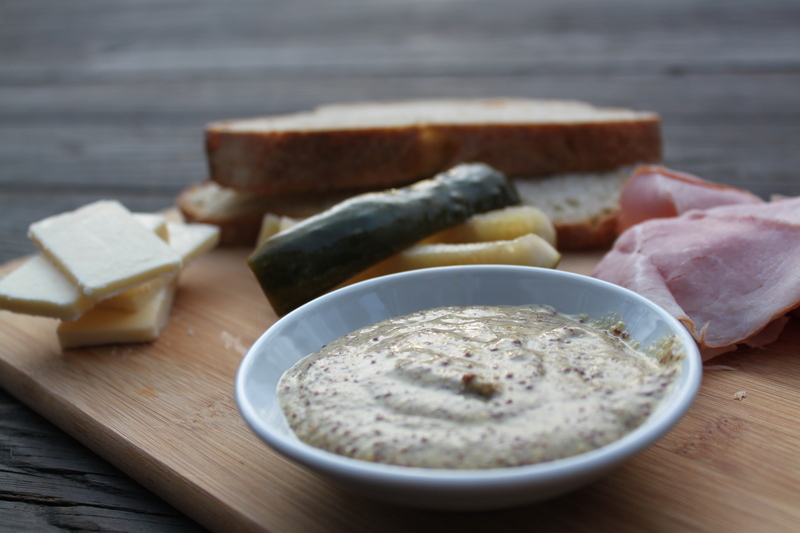 Blaze Mustard – this recipe originated with the Beeroness, and was modified a bit. If you have not had a chance to check out her blog, we highly recommend you do so. Mix the mustard seeds, mustard powder, beer, vinegar and salt and let sit covered on a counter for 8-12 hours. Pour the mixture in a blender, and add the horseradish, honey, and Tabasco. Blend until it thickens, and most of the seeds are blended, but you want to leave some whole, whatever looks good to your eye. Keep refrigerated. Makes about 8 oz. of mustard.